There’s no Pro12 team involved. The prize on offer for the kings of European rugby. IT WILL BE an English-French affair in the last eight of the European Rugby Champions Cup after the group stages concluded today. There is no Irish team involved in the quarter-finals for the first time since 1997-98 and indeed there is no representative from the Pro12 in the knockout stages. Instead the tournament will be battled out between five English clubs and three French clubs. Here is the full line-up for the games which will be played over the weekend of 8/9/10 April. The semi-final draw has also been made with the games pencilled in for 23/24 April. The final takes place in Lyon on 14 May. Email “Here is the complete quarter-final line-up for the Champions Cup”. 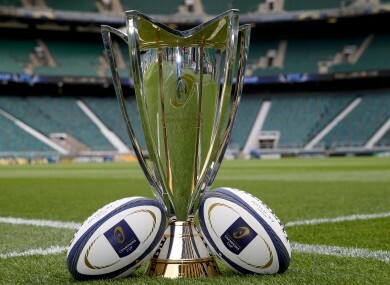 Feedback on “Here is the complete quarter-final line-up for the Champions Cup”.